Apple releases new iPhone 6s and iPhone 6s Plus to the world, with New Zealanders first in line. New Zealand became the first country in the world to get its hands on the new iPhone 6s and iPhone 6s Plus today, with Apple launching its new smartphone range in Auckland this morning. Two weeks on from the official launch, and following months of speculation, the tech giant’s flagship device finally arrived on Kiwi shores, beating the rest of the world through that lovely thing called time difference. 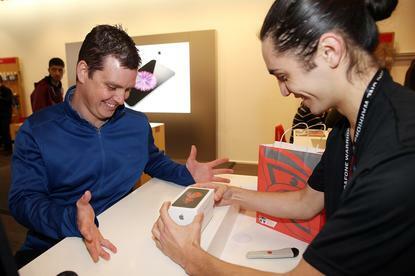 The release marks the first time since 2008 that New Zealand has been a world-first in an Apple iPhone launch. But for the first time in Apple history perhaps, the tech giant was slightly overshadowed by an even bigger event taking place, as the nation sat down to watch the All Blacks thrash Namibia in the Rugby World Cup. That of course didn’t stop a hoard of tech enthusiasts descending on Vodafone’s Queen Street store in Auckland to purchase the new devices. As revealed by Computerworld New Zealand, Kiwis can buy the phone models standalone, with the iPhone 6s coming with 16GB, 64GB and 128GB of storage for $1,999, $1,399 and $1,599 respectively. In addition, the iPhone 6s Plus is available with 16GB, 64GB and 128GB of storage for $1,399, $1,599 and $1,799 respectively, with all devices available in Silver, Gold, Space Grey and Rose Gold finishes. According to Vodafone, the iPhone 6s 16GB will be available starting at $0 on the Vodafone Red+ plan for $129 per month on a 24-month term and iPhone 6s Plus 16GB will be available starting at $199 on the Vodafone Red+ plan for $129 per month on a 24-month term. The iPhone 6, iPhone 6 Plus and iPhone 5s will also be available with Vodafone offering Kiwis the option of a free upgrade every year on the Vodafone Red+ Super plan on a 24-month term. Of the other telcos, Spark says the iPhone 6s 16GB is available starting at $50 per month on the Spark $59.99 Open Term, 24-month interest free plan and above. The iPhone 6s Plus 16GB will be available starting at $59 per month on Spark $59.99 Open Term, 24-month interest free plan and above - iPhone 6, iPhone 6 Plus and iPhone 5s will also be available. Over at 2degrees, the iPhone 6s is available on a 24-month plan, coming in at $49, $58 and $66 for 16GB, 64GB and 128GB models respectively. The iPhone 6s Plus is available available on a 24-month plan, starting from $58, $66 and $74 for 16GB, 64GB and 128GB models respectively.